P is for Portugal. And problems. NEW YORK (CNNMoney.com) -- Just when investors thought it was safe to stop worrying about Europe, Wall Street got a reality check from credit rating agency Fitch. Stocks dipped Wednesday morning and the primary reason was Fitch's downgrade of the default ratings of Portugal, which is a member of Europe's debt-ridden PIIGS club. There are still concerns about whether the European Union will lead a rescue package of Greece or if the International Monetary Fund will have to step in instead. But in its report, Fitch pointed out that Portugal's debt problems are also significant. "A sizeable fiscal shock against a backdrop of relative macroeconomic and structural weaknesses has reduced Portugal's creditworthiness," said Douglas Renwick, associate director in Fitch's sovereign team, in the report. Fitch noted that Portugal's government deficit was 9.3% of its gross domestic product last year, well above Fitch's forecast of 6.5% from last September. The rating agency added that another downgrade was possible later this year or in 2011 if Portugal did not get its fiscal house in order. So why does Portugal, a nation with about 11 million people that's roughly the size of Indiana, matter? As was the case with Greece, the concern is that its fiscal problems won't be contained. Since Portugal, like Greece, is a member of the group of countries that use the euro currency, any problems with one euro constituent -- let alone five -- can spread and have a disastrous effect on the entire currency. "The real concern is that it's another shoe dropping. Its not just about Greece anymore," John Stoltzfus, senior market strategist with Ticonderoga Securities, an institutional trading firm in New York..
Ratings downgrades also can make problems for a country that's already heavily in hock even worse since downgrades tend to raise the cost of borrowing and interest payments on existing debt. All of this is making investors increasingly nervous and helped push the euro down Wednesday to its lowest level against the dollar in ten months. It is even making some wonder if the euro is now as toxic an asset as subprime mortgages were at the height of the credit crunch. "There are problems in all the PIIGS nations," said Kathy Lien, director of currency research at GFT, a foreign exchange and futures brokerage firm in New York. "There's always more than one cockroach. Countries have announced austerity measures to reduce their debt but that's going to take time to play out." Still, others think that Portugal's problems are not going to spill over and wreak havoc on the rest of the continent. 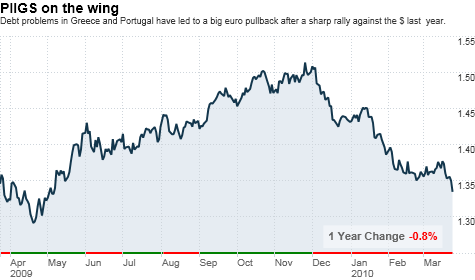 "The downgrade is a deserved slap on the wrist to Portugal. It's an appropriate response by Fitch. But I don't think Portugal is in as bad shape as Greece, and neither are Spain or Ireland. I don't subscribe to the contagion theory," said Axel Merk, president of Merk Mutual Funds, a Palo Alto, Calif.-based money manager specializing in currency investments. Merk also pointed out that Fitch merely downgraded Portugal's credit rating to AA- from AA. Greece, by way of comparison, has a far lower credit rating of BBB+ from Fitch. It's also reasonable to wonder if a weaker euro is really that big of a problem for the U.S.
Sure, it used to be the case that U.S. stocks tended to rally anytime the euro strengthened against the dollar and fell when the dollar gained ground. The somewhat perverse logic was that investors were using good economic news to dump safer dollars in favor of riskier assets like stocks, commodities and other currencies and rush back to the perceived security of the greenback on bad economic news. But as I pointed out in a column earlier this month, the stock market has started to move in tandem with the dollar. Good news for the U.S. economy is increasingly viewed as good news for shares of U.S. companies and the dollar. So more problems in Europe may not necessarily dent the U.S. markets and economy for the long-term. Stoltzfus said investors have to pay attention to Portugal and the other PIIGS, but that it might be best to not get too caught up in the daily headlines about what's next for Europe. "This isn't a red light on the dashboard. It's an amber light flashing," he said. "This creates an environment of heightened risks that investors have to recognize but I don't think this will derail the economic recovery." Lien wasn't so optimistic though. She said that the downgrade of Portugal is just another example of credit ratings agencies getting more aggressive. That could lead to eventual ratings cuts of other nations, including the United States and United Kingdom. She was quick to point out that she thought neither country was likely to be downgraded by Fitch or its two largest rivals -- Moody's and Standard & Poor's -- anytime soon. But Moody's analysts indicated in a report last week that the margin of error for the U.S., U.K., Germany, France and Spain -- all of which are rated triple-A, the highest of possible credit ratings -- has "substantially diminished" because of rising debt levels and a still-fragile global economy. Still, Merk argued that nobody should be surprised by the fiscal problems facing Europe. He said it's a universal problem. So in some respects, the focus on ratings cuts may be somewhat meaningless if everybody's in the same boat. Perhaps nobody deserves a perfect triple-A rating. "Sovereign debt is a global problem. Every country in the world, including the U.S., has the same challenges and we all have to learn how to deal with it," Merk said. Bring out the gimp! I was Tweeting yesterday about the large amount of unsubstantiated takeover rumors that are circulating on Wall Street these days. That brought to mind the following movie quote. "When you little scamps get together, you're worse than a sewing circle." I challenged my followers to name the film that was from and promised that the winner would get the prestigious honor of a shout-out in today's Buzz. Congrats to Kevin Dixon of Plano, Tx. for being the first to correctly identity the source as Uma Thurman's Mrs. Mia Wallace in "Pulp Fiction." 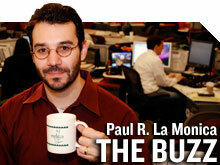 Anyway, The Buzz will be taking a short hiatus but will be back on Monday. - The opinions expressed in this commentary are solely those of Paul R. La Monica.